While Monaco was absent from the Eurovision Song Contest between 1980 and 2004, they did participate every year between 1959 and 1979. And so, 'Les jardins de Monaco', performed by Caline and Olivier Toussaint has the unique distinction of being the penultimate entry for Monaco before they gave up in the 20th century. 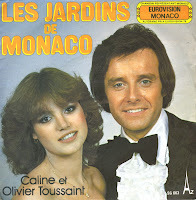 'Les jardins de Monaco' is a mid-tempo disco duet, which makes it sound a bit dated now. At the close of voting during the 1978 Eurovision Song Contest, it finished fourth in a field of 20 competitors.